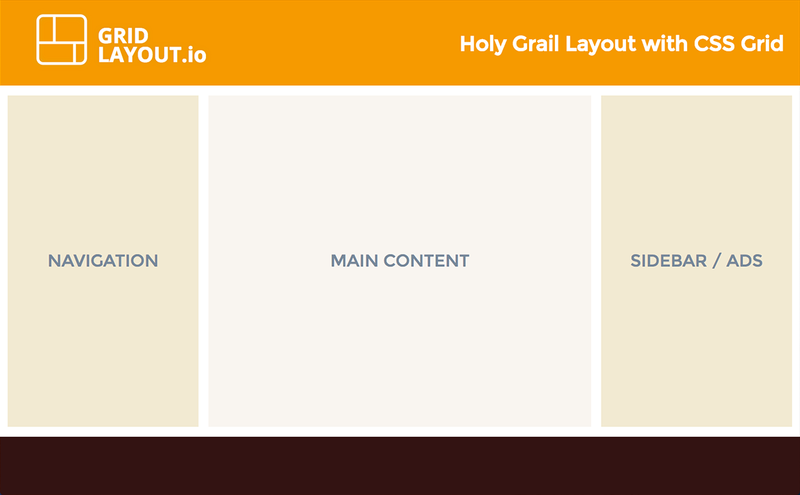 Holy Grail is a layout pattern that’s very common on the web. It consists of a header, a main content area with fixed-width navigation on the left, content in the middle and a fixed-width sidebar on the right and then a footer. Holy Grail has been achieved using variety of methods, probably most notably recently with Flexbox. CSS Grid Layout is yet another method, and it should prove to be the most appropriate and straightforward way when browser support gets better. It was designed especially to easily accomplish full page layouts. You can see this demo in action here if you have a supporting browser. Here are quick instructions on how to enable grid layout in Fixefox and Chrome. Notice the use of height: 100vh (100% viewport height) on the container to extend the grid to at least the full height of the viewport. Our grid’s middle row is set to a height of 1fr so that it picks up the extra space when needed. Grid is not a replacement for Flexbox and Flexbox is still the right solution for one dimension placement and micro layouts. It’s very easy to combine grid and flexbox layouts and they are designed to work well together.